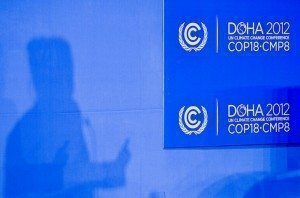 In typical international climate summit fashion, COP18 ended in a last–minute marathon session complete with frustration, accusation, acrimony and a halting step forward in what is called the “Doha Climate Gateway” deal. One of the main features of the deal is breathing the last gasps of life into the Kyoto Protocol, the first commitment round of which is set to expire at the end of the month. What’s left of the Kyoto Protocol will have little impact on global carbon emissions, especially with Russia, Japan, New Zealand and Canada refusing to join for a second commitment. The remaining countries, including the 27-member European Union, Australia, Switzerland and eight others did not increase their emissions reductions pledges from nearly 15 years ago. In total the Kyoto Protocol only represents 15 percent of total world carbon emissions. While the Climate Gateway Deal did manage to keep the Kyoto Protocol alive, the substantive outcome from the climate talks in Doha is to help shine a light on the path to 2015 when, in theory, a new deal will be made that brings all nations into account for reducing their carbon emissions–a deal set to take effect in 2020. One sticking point in negotiations that lingered into the wee hours of Saturday morning was over a dispute between the United States and vulnerable developing countries seeking compensation from rich nations for damage “loss and the damage” a new issue catching the United States by surprise. US negotiators pushed back against small island nations and others from the most climate vulnerable countries for fear of being exposed to “unacceptable liability.” Any “compensation” said the US, would only be considered as “aid.” In the final deal, the Climate Gateway “promised” to have set in place by 2013 a system that could see rich nations paying billions of dollars more for disasters linked to climate change. As in every COP since, Doha took up the pledge given at COP15 in Copenhagen from developed countries to provide $100 billion for climate mitigation to poor nations by 2020. “Vague assurances” in the Climate Gateway text promises funding for climate adaptation and technology transfer will continue and grow. Tod Stern, US special envoy for climate change, expressed his satisfaction with the final outcome in Doha, characterizing what was accomplished as “unspectacular but important.” By resolving left over issues like finance and technology, Stern said, the pathway from the Kyoto Protocol, which only binds a few rich countries to cut carbon, to a globally binding agreement for all nations to reduce their carbon emissions. And, as with all COP meetings of recent memory, those of growing pains are obvious. Delegates from low–lying nations and African countries, in other words those most vulnerable to climate change and with the least historical responsibility for causing it, expressed bitter disappointment with yet another week agreement hammered out in desperate last-minute marathon session, which has become the hallmark of the COP negotiating process. A deal they say does nothing to reduce carbon emissions or actually guarantee any money to aid these countries and climate mitigation. “Those who are obstructive and self-serving need to realize we are not talking about impacts on how comfortable you people live, but whether or not our people will live,” said Nauru Foreign Minister Kieren Keke. The bitterness, acrimony and dissolution may be all that can be expected in such a lumbering, complex negotiation. Ultimately steps were taken with the hope that by 2015, only 3 years hence, a global agreement can be forged that all nations can agree upon that by 2020 the nations of the world will share the collective goal of reducing carbon emissions, reducing before a station, strengthening resilience and building adaptation for a climate changed world.